Most trade show exhibits today make use of multiple electronic devices. Display monitors, computers, interactive exhibits and other electronic devices need cables. 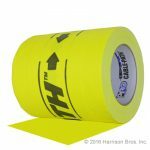 Cable Path Tape is designed to allow you to add or remove cables without untaping those already in place. Siimply slide another power, data or audio cable thru the non-adhesive path in the tape and keep things nice and tidy. « Colored Gaffers Tape-Paint On A Roll!